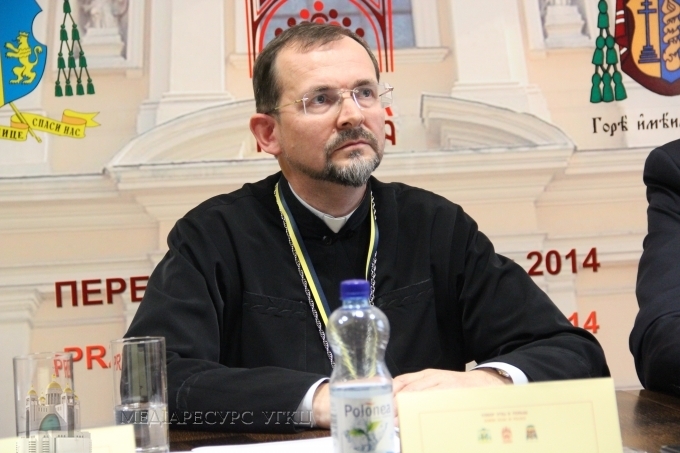 Bishop Bogdan (Dziurakh): "Guided by love to people, the Church aims at sharing its treasure of faith"
The сatechetical efforts of the Church are motivated by a desire of good to everyone. That was said on 17 October by the visitor of the VI session of the Diocesan Cathedral of Sambir-Drogobych Diocese, the Bishop Bogdan (Dziurakh), the Secretary of the Synod of Bishops. In his report entitled "Actual tasks and challenges in the area of ​​catechesis" the Bishop Bohdan identified five objectives of the catechetical ministry of the Church. The responsible for the catechetical ministry should look after the faithful to make their knowledge of the Christian faith content deeper. The catechetical science teach the believers how to live in accordance with the God's law. The Bishop Bohdan cited statistics according to which in Ukraine there are more than 85 percent of people declare themselves as Christians. Despite of this, the corruption, alcoholism, murder of unborn children are flourishing in society. This shows that Christians do not live according to their faith. Another important task of catechesis, in the speaker’s opinion, is to help the faithful in the case of prayer. It helps Christians to deepen their relationship with God. When the faithful knows God, has understood the meaning of the Christian faith, he still needs help to witness his faith in the community. Through the catechetical teaching Church prepares Christians to live in the community. In this light the significant importance is the preparation of marital couples. According to the Bishop Bogdan the first catechists in the Church are bishops. On their behalf every priest is the chief catechist in the parish entrusted to him. However, the speaker emphasized the exceptional role of the parents in the case of catechesis of children. "The parents, the family should be the first catechists of their children" - said the Bishop.